I had a good feeling about this CD from the first few bars of the Haydn. The interplay between piano and strings seemed immediately right, crisp and sparkling. The runs on the keyboard that dominate the first movement made me smile in appreciation, and brought to mind the pianism of Susan Tomes, from the now defunct and much lamented Florestan Trio. Tempos are slower in the outer movements than the Beaux Arts Trio, but similar to those of the Florestans (review). In the Presto final movement, there were times when I thought that a little more speed would have been warranted, but again, they are only 20 seconds slower than the Florestans. With the Haydn establishing the trio’s credentials, we move to the two works which, I suspect, will be the focus of attention for most purchasers. Both are world premieres, and justify the CD’s title of Found: cellist Matthias Wilde uncovered both of them whilst working in Dessau. I had at least heard of August Klughardt, as CPO has been working on his orchestral output in recent years (Violin concerto ~ Symphony 4 ~ Symphony 5) as have Sterling (review). On the other hand, Friedrich Schneider was a complete unknown, and not to just me, as this is the only recording of his works listed on Presto Classical. You can read some biographical information about the former at one of the reviews listed, but I should introduce Schneider. He was born in a small village in Poland, near the German border, and educated musically by his organist father. He furthered his studies in Leipzig, and worked professionally there, including a posting as organist at the Thomaskirche. His most prominent position was as Kapellmeister for the court of Anhalt-Dessau. Much of his compositional output was choral, but according to his Wikipedia entry, he also wrote 23 symphonies and 7 piano concertos – intriguing to say the least. 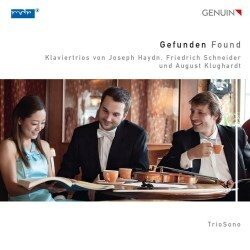 Schneider’s trio has, unsurprisingly, elements of late Haydn and early Beethoven, and the first movement, of four, maintains melodic and rhythmic interest throughout. The second movement Larghetto is less convincing – a little too lumpen for me – but the Scherzando and Presto finale are thoroughly good fun. The Klughardt begins with a noble theme, which soon mutates into something more aggressive, before a lyrical second figure emerges. The development is very Brahmsian. The slow movement is soulful, and lives up to its cantabile marking. While the piano has some playful episodes, the strings maintain the graceful, sad atmosphere. The finale is an odd beast: it begins with a fugato before moving into a second theme which is more akin to a rustic country dance. I’m not entirely convinced by it, but the players make as good a case for the movement, and the whole work, as is possible. TrioSono formed in 2012 in Leipzig, a city to which each player has a significant musical connection. Both string players were born in the city, and violinist Niebuhr is a member of the Gewandhaus Orchestra. Hiroko Kudo, born in Japan, studied in Leipzig. This is their debut recording, and they have shown by these performances that they are an ensemble to watch in the future. They have chosen wisely in not simply recording well-known works. The booklet notes are exemplary, and the sound quality is very natural. All in all, this is a very fine recording, which collectors of the unsung will definitely want, and lovers of the piano trio will appreciate greatly.